eMoney Advisor provides a full-view of your entire financial picture, not just the assets a financial planning team may manage. We can organize and consolidate all of your financial accounts to get a full-picture of your finances. Assets are summarized daily so you can see what’s working and what may need adjusted. 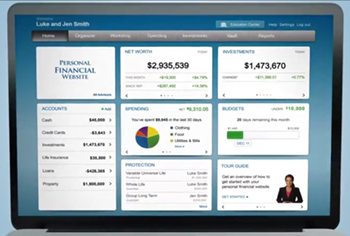 You can also create a budget and track spending and cash flow. 24/7 online access and automatic alerts keep you up-to-date on any changes. You can learn more about eMoney Advisor by watching this video.